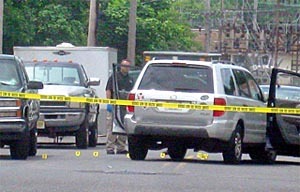 Evidence markers dot the scene around the silver sport utility vehicle of Neptune Police Sgt. Phillip Seidle on Sewall Avenue at Ridge Avenue in Asbury Park June 17. He is charged with murdering his ex-wife, Tamara Seidle. Tamara Seidle was remembered this week as a wonderful and loving mother, who was very involved with her children and their activities but was never too busy to show her appreciation to others; to thank the choir at Holy Spirit Church in Asbury Park for singing at her child’s confirmation she brought them a cake. As a member of the Red and Black Booster Club in Neptune she helped out at football games. On Tues., June 16 her ex-husband, Neptune Police Sgt. Phillip Seidel, 51, was arrested and charged with shooting and killing her in her car just before noon at the corner of Ridge and Sewall Avenues in Asbury Park. The couple’s divorce was finalized May 27. They had nine children, ages 7 to 24, and Tamara had custody of the minor children. At one point Seidle, as shocked residents watched, put his gun to his head and held off police officers for a half hour before surrendering. “He (Seidle) was saying, ‘My kids, my kids, I’m not going to see them anymore,’” said Trina Poyser, 44, of Asbury Park whlo was at the scene. Poyser was recounting what she saw involving Seidle and fellow law enforcement officers that morning. The shooting took place in front of the couple’s seven-year-old daughter who was in the car with her father at the time. Seidle was charged with murder, possession of a weapon for an unlawful purpose and endangering the welfare of his seven-year-old daughter, said Monmouth County First Assistant Prosecutor Marc C. LeMieux. Bail was set at $2 million with no 10 percent option. Joan Schuler of Interlaken, a member of Mother of Mercy Parish in Asbury Park, said Tamara ran the CCD program for the parish. “She really and truly was such a good person and wonderful mother to her children,”Schuler said. Tamara was the director of religious education for the parish. Three of the couple’s children attend Our Lady of Mount Carmel School in Asbury Park. A prayer service was scheduled for press time at the church. Asbury Park Police became involved when they responded about 11:25 a.m. to a motor vehicle accident on the corner of Sewall and Ridge Avenues on the boundary with Neptune, LeMieux said. After Seidle “was chasing” his ex-wife for a few blocks to Ridge Avenue north, where she, driving a car, turned west onto Sewall Avenue and hit a parked car, LeMieux said. “That’s where it stopped,” LeMieux said. Seidle, off-duty and in shorts and a polo shirt, exited a sport utility vehicle, in which his daughter was riding in the front passenger seat, LeMieux said. Then, Seidle put the gun to his head, while police officers rescued his daughter, LeMieux said. Seidle, then, shot three times through the front window of his wife’s car, LeMieux said. “She was shot multiple times,” LeMieux said. Meanwhile, law enforcement officials are investigating reports from those at the scene that police did not stop the shooter. A standoff ensued “while he (Seidle) had a gun to the side of his head,” LeMieux said. By 11:52 a.m., Seidle had given up and was safely in custody, said LeMieux, crediting several law enforcement officers who had spoken to Seidle. Asbury Park Police “were in the area when the shots began,” LeMieux said. “I saw him with the gun pointed to his head,” said Kevin Barksdale, 43, who lives a few house away from the shooting site. Barksdale, who works a late night shift at the Asbury Park Press in Freehold Township, said the gunshots awakened him. The investigation remained open following the standoff, with the prosecutor’s office asking to see any cellular telephone videos shot by the public of the incident. Seidle and his ex-wife lived at different Neptune addresses. It was unclear how many children Tamara Seidle had custody of. Neptune Police, which Seidle joined in 1993, are “concerned for the wellbeing of the entire Seidle family in this very difficult time,” LeMieux said. Seidle was first hired as a patrolman on July 1, 1993, and has held the rank of sergeant in the Patrol Division since his promotion on Jan. 1, 2009. Seidle is a veteran of the U.S. Navy serving from March 1986 until his honorable discharge in November 1990. Beside Asbury Park Police and the Prosecutor’s Office, also involved were the county Sheriff’s Office, Neptune Police and federal marshals. Posted in Asbury Park City Desk, Shore Communities and tagged Asbury Park, Joe Sapia, Neptune.